I’m currently working with Dr. Steven Manchester on a project regarding the floristic diversity of the Oligocene Catahoula Formation in Texas, though I plan to initiate a larger phylogenetic project over a yet-to-be-decided-upon angiosperm lineage for my dissertation. 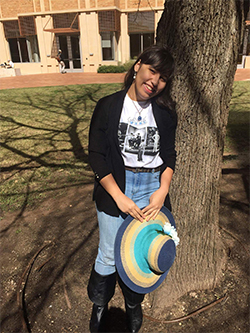 I received my Bachelor of Science degree in Geology with a minor in Biology from the University of Texas at Austin, wherein I conducted research on a species of traversodontid eucynodont Exaeretodon argentinus using CT data to study its ontogeny and dentition. I am very interested in morphological evolution (especially as is reflected through phylogeny), and have an endearing love for collections. I am a new PhD student working with Dr. William DiMichele (National Museum of Natural History) and Dr. Steven Manchester (Florida Museum of Natural History). 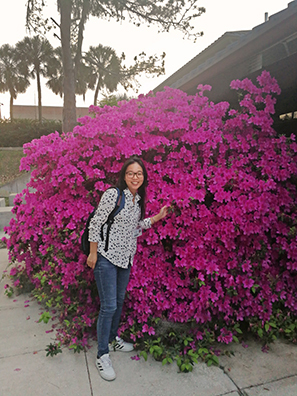 I come to the University of Florida with an undergraduate background in tropical horticulture and a Master of Science in Geography. My research interests center on the biogeographic connection of paleobotanical and palynological evidence with changing climate and migratory pathways during the Paleozoic. I hope to gain a better understanding of the historical processes influencing the community structure and radiation patterns present in the Permian landscape of North America. Major themes of this research include the evolutionary relationships of plant communities as well as the influence these communities have on the environment and what this indicates for future climate. My current research is focused on temporal and spatial distribution of the Permian Period Gigantopterids through examination of their biogeography, stratigraphy, and systematics. I’m a Masters student working under Dr. Steven Manchester. 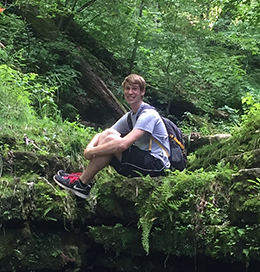 Before attending the University of Florida, I received undergraduate degrees in Earth Science, Environmental Science: Geology, and Biology: Ecology & Evolution as well as a minor in Geology from the University of Northern Iowa. For my thesis, I am researching the evolutionary history of Betulaceae (the birch family) by incorporating morphological data from fossil and modern taxa into molecular phylogenetic analyses of the modern taxa. From this, I hope to build a more accurate phylogeny with improved divergence date estimates. I am also interested in studying the historical biogeography and diversity of Betulaceae to better understand how its global distribution has changed throughout time. In addition, I am taking courses through the Education Department that are going toward a minor in Science Education. I got my BS in Zoology and minor in Geology from Oregon State University. There I helped describe a new species of Cretaceous Osmundaceous fern from British Columbia along with Drs. Gar Rothwell and Ruth Stockey. For my thesis I am working on describing the flora preserved in lake sediments from new localities of the Eocene Clarno Formation of Central Oregon. One of my goals is to try to figure out the paleoelevation for the sites and date them in order to make accurate comparisons with other floras. By making these comparisons, we can hopefully have a better understanding of climate change during this time and know more about the biogeography of the plants at these sites. 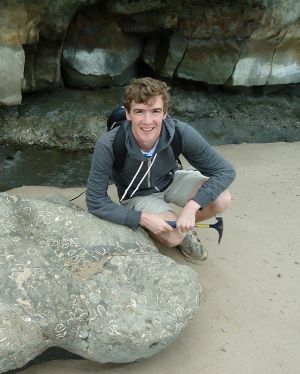 My other research at UF looks at the paleobiogeography of butternuts and at paleontological outreach under FOSSIL (Fostering Opportunities for Synergetic STEM with Informal Learners) – https://www.myfossil.org. I have a strong interest in the Mesozoic plants and the palaeoenvironment reconstruction. My research mainly focuses on early Mesozoic floras, especially those across the Triassic-Jurassic boundary. Studies on the relationship between these macrofossils and their paleogeographic history, paleoenvironment and paleoclimate are very appealing to me. I am also interested in the Mesozoic fossil materials from North America. As a visiting scholar at the Florida Museum of Natural History, I am currently working on two projects. One project is to try to better understand the morphology and possible affinities of Tricalycites, a genus of Cretaceous winged fruits. Under the guidance of Dr. Steven R. Manchester, I have examined the fossil specimens using epifluorescence microscopy and micro-CT scanning. These results help us better characterize the morphology and its possible affinities, and provide us a better understanding of Late Cretaceous coastal vegetation, and the diversification of angiosperms. The other project that I’m currently working on is to use micro-CT scan data on the calcified reproductive organs (probably belong to the Gnetales) from the Jurassic Morrison Formation to reveal their internal structures. The results provide some important information for us to better understand the affinities of these fossils. 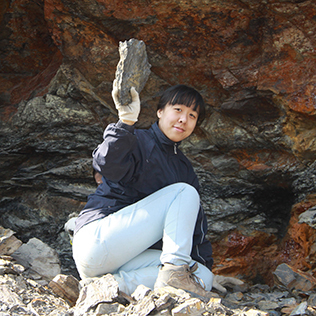 My research interests are studying Cenozoic paleobotany and paleoclimate. Before I came here, I received my Ph.D. degree in July 2016 from Kunming Institute of Botany, Chinese Academy of Sciences under the guidance of Prof. Zhekun Zhou, and my doctoral thesis is focusing on the plant diversity, paleoenvironment and paleoclimate of a late Pliocene carpoflora of Saying Formation in Northwestern Yunnan, China, and I made detailed taxonomic and phytogeographic studies on the fruit/seed fossils of several taxa (Aralia, Zanthoxylum, and Eurya). Currently in FLMN I am still working on some coniferous fossils from that flora, meanwhile I am doing some researches on maple fruit and leaf fossils collected from western North America (e.g., Eocene John Day Formation and Miocene Succor Creek Formation) and Staphylea fruit fossils from late Oligocene Woodworth flora, Montana with the aid of micro-CT scanning method. I am keen on field work for fossil collections as well as modern plant investigations. Jane has been volunteering at the McGuire Center’s butterfly collection and the Paleobotany and Palynology division in Dickinson Hall since December 6, 2007. 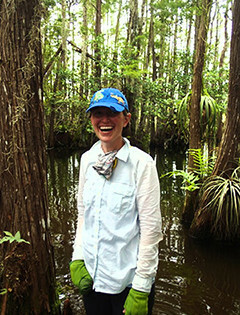 At the same time, Jane also serves at the Paleobotany and Palynology division in Dickinson Hall, utilizing her strong botany background and experiences in research labs to help curate the fossil plant collection. With Jane’s help, two monographs documenting the flowering plant diversity based on fossil flowers, fruits, and seeds preserved in rocks collected from localities from northern Mississippi and western Tennessee have been published, and three projects are in progress. 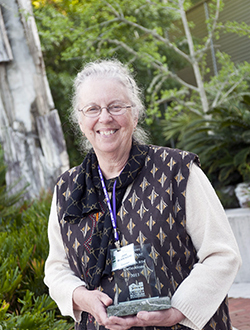 In 2011, Jane won the James Pope Cheney Volunteer of the Year Award, presented annually to recognize the Florida Museum of Natural History volunteers who have demonstrated exceptional interest in the collections of the Museum, sincere and extraordinary interest in the educational advancement of children; and enthusiastic support for our community of volunteers.